This shampoo kills fleas and ticks while it cleans and deodorizes in one easy and convenient step. 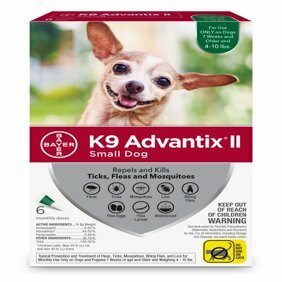 This rich, conditioning formula contains a highly effective flea and tick killing ingredient combined with an insect growth regulator that sterilizes new fleas and kills their eggs. Ingredients: Active Ingredients:Phenothrin - 0.270%.Pyriproxyfen - 0.075%. (s)-Methoprene - 0.040%.Other ingredients: 99.615%.Total - 100.000%. Instructions: Directions for Use: It is a violation of Federal law to use this product in a manner inconsistent with its labeling. Read entire label before each use. Use Restrictions: Apply this product only as specified on this label. Do not contaminate food or feedstuffs. Except when applying directly to pets, do not apply this product in a way that will contact adults, children or pets, either directly or through drift. Do not apply this product to puppies less than 12 weeks of age. Do not apply this product to cats or kittens. Use only in dogs. Do not use on puppies under 12 weeks of age. Do not use on cats or kittens. Amount of Shampoo: 1 tablespoon (15 ml); Weight Range: Less than 15 lbs. Amount of Shampoo: 2 tablespoons; Weight Range: 16-30 lbs. Amount of Shampoo: 3 tablespoons; Weight Range: 31-45 lbs. Amount of Shampoo: 4 tablespoons; Weight Range: 46-60 lbs. Amount of Shampoo: 5 tablespoons; Weight Range: 61-75 lbs. Amount of Shampoo: 6 tablespoons; Weight Range: 76-90 lbs. Amount of Shampoo: 7 tablespoons; Weight Range: 91-105 lbs. Amount of Shampoo: 8 tablespoons; Weight Range: 106-120 lbs. Amount of Shampoo: 9 tablespoons; Weight Range: 121-135 lbs. Amount of Shampoo: 10 tablespoons; Weight Range: 136-150 lbs. 1. Use 1 tablespoon (15 mls) of shampoo per 15 lb of body weight. 2. Wet pet's coat thoroughly with water and rub shampoo into coat starting with head. 3. Keep out of pet's eyes. 4. Work backward from head to tail until coat is completely covered with foamy lather. 5. Let stand or continue to massage in for 5 minutes. 6. Rinse and towel dry. 7. Repeat weekly (if necessary). Storage and Disposal: Do not contaminate water, food or feed by storage and disposal. Pesticide Storage: Keep this product in its tightly closed original container, when not in use. Store in a cool, dry (preferably locked) area that is inaccessible to children and animals. Pesticide Disposal: Wastes resulting from the use of this product may be disposed of on site or at an approved waste disposal facility. Container Disposal: Non-refillable container. Do not refill or reuse this container. If Empty: Offer for recycling, if available. If Partly Filled: Call your local solid waste agency for disposal instructions. Never place unused product down any indoor or outdoor drain.